In 1985 Iron Maiden was on top of their game. They had just completed their longest world tour, the World Slavery Tour, and had written 5 successful albums. Despite this, there were rumours of inner conflict. The 12 month World Slavery Tour had obviously taken its toll on the band. Maiden was so burnt out that they decided to go on a 6 month hiatus, something they had never done before. The vacation seems to have been a Godsend for guitarist Adrian Smith. The extra time off gave him more time to write songs for the next album. No longer did he need Bruce Dickinson to write the lyrics his melodies. Each of Smith�s songs is catchy and interesting. Unfortunately, Adrian�s songwriting breakthrough meant that Bruce would not have any writing credits on the album. There isn't any Revelations or Powerslave this time. The first thing you will notice while listening to Somewhere in Time is the addition of guitar synths. However, they fit the futuristic themes of the album perfectly, and are not over done. Aside from the new guitar synths, Maiden's formula hasn�t changed a whole lot. The galloping riffs are still present. The music is still melodic. The instrumental sections are still long and great. If it isn�t broken, don't fix it, right"
The album starts off with the title track, Caught Somewhere in Time. In the intro guitar synths are used effectively to imply the time traveling themes of the lyrics, though they nearly disappear as the song progresses. The guitar's give off a futuristic feel, and maintain an excellent pace. Of course, the bass isn�t going to be left in the dust. For Caught Somewhere in Time, Steve Harris gallops along on his bass guitar. The drumming sounds pretty good, and helps the bass provide extra rhythm. Both Dave and Adrian turn in excellent solos, with Adrian�s being especially impressive. Overall, a good opener for the album. Kicking off with an excellent riff is Wasted Years. Not only is it the first single off of the album, Wasted Years is also the first song Adrian has written by himself. (For Maiden anyways.) Wasted Years is one of the band's most accessible songs, but that doesn't make it bad. The song is catchy and lighter, both musically and lyrically, than most Maiden songs. About two and a half minutes in, the intro is replayed, and the listener is treated to a cool instrumental section, which leads into a beautiful, yet short 16 second solo from Adrian Smith. One irk I have with the song is the backing vocals in the chorus. If you aren't paying much attention, they sound like they mix with Bruce's singing, and bring the quality of Bruce's voice down. With that, Adrian Smith's second song of the album begins. Sea of Madness starts off with a cool riff from Adrian and Dave, which spearhead the song before the vocals begin. Bruce�s singing is excellent in the song, especially during the chorus which, like Wasted Years, is pretty catchy. The verses of the song aren't the bands best, but the chorus and Adrian Smith�s solo are strong as ever. Sea if Madness gets a bit slower around the 3:00 mark and Bruce takes over with one of his top performances on the album. The guitars take the lead again, and the band returns with one more chorus, before the song fades out. An underrated song for sure. The next song, Heaven Can Wait is a lengthy track about near death experiences. Despite, the song subject, it is a very happy sounding song, which uses synths throughout the track. The song has several sing-along choruses just waiting to be shouted by crowds at concerts. Also featured in Heaven Can Wait, is another lengthy sing-along section, which was definitely written for concerts, and sounds pretty cool. However, the song is on the long side, and definitely could have been made shorter. One of the weaker tracks on the album. Maiden roars back with The Loneliness of the Long Distance Runner, one of the most thought provoking songs on the album. The lyrics depict a long distance race, but can be interpreted as a metaphor for life as, like a long distance race, life can get more challenging as it progresses, but you have to trudge on and never give up, or something to that effect. Starts off slow and melodic, but when Bruce belts out the first verse, it gets quicker, and emulates the speed needed to keep up in a race of this sort. Bruce�s out of breath vocals fit the song�s lyrics perfectly. An excellent contribution from Maiden's bassist. The sixth song, Stranger in a Strange Land, is a more laid back effort. For this reason, it�s no surprise that Adrian Smith's final song of the album is the second single. The music is on the simple side, but is pretty catchy and has a nice groove to it. Bruce delivers some of his best vocals, and they really carry the song. After a cool harmony section, Adrian Smith plays an excellent solo that compliments the music rather well. The song's lyrics are about a man who fell from his boat on an arctic expedition and was found 100 years later oblivious to where he was. Stranger in a Strange Land isn�t Maiden�s best song by far, but is one of my favourites, nonetheless. The album then turns to a Dave Murray track. Up to this point, Dave had only written/co-written 3 songs for Maiden, (Sanctuary, Charlotte the Harlot, and Still Life). The song, titled Deja-Vu begins with a solo from Dave Murray, which sounds pretty cool, which then fades out into a decent riff accompanied by guitar synths. The chorus' melody is insanely catchy, and while the vocals might not stick out, the tune will likely be stuck in your head for the next few days. The weakest part of the song is the lyrics. They seem quite strange and silly when you read them, which is unusual for a Maiden song. Deja-Vu features some excellent vocals from Bruce. On each of their albums, Iron Maiden, Steve Harris specifically, has always written a brilliant epic (except for Killers if I'm not mistaken). Many times these epics are one of the top two songs on the album. Iron Maiden had Phantom of the Opera, Number of the Beast had Hallowed Be Thy Name, and Somewhere in Time has Alexander the Great. Like the great Harris epics, it features a long instrumental section. Adrian Smith really shines here, as 2 of the 3 solos are played by him. The lyrics are nothing to write home about however, which is disappointing, but Bruce still manages to find a way to make the song interesting lyrically and vocally. Alexander the Great is definitely an amazing song, but has strangely never been played live before. Lasting over 8 minutes in length, it is a great way to end the album. 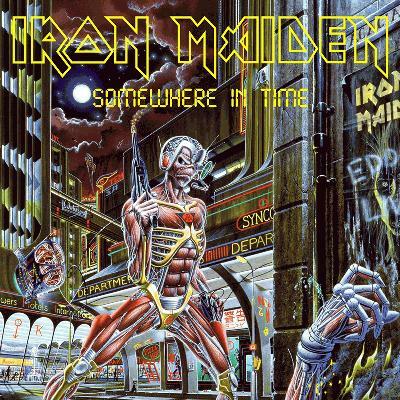 For a band that had hardly changed its style over 5 albums, Somewhere in Time was an adventurous release. Though not as powerful as Powerslave, Somewhere in Time is an excellent effort from Iron Maiden. From the brilliant cover art to the last riff on Alexander the Great, Iron Maiden continued to impress the world with their amazing releases, excellent musicianship, and insane performances. Somewhere in Time is definitely an album you won't want to miss. This is easily my favourite Maiden album, just edging out Powerslave. This album just has such solid writing. The only bad song is Heaven Can Wait. Good review aswell. It was sort of the same for me too. Before I bought it I had only heard Wasted Years amd Stranger in a Strange Land. I don't know why. I prefer it to Piece of Mind and Number of the Beast. Thanks for the compliments by the way. Great review. I never could get into Maiden as well, but I did like "Wasted Years", so I might pick this bad boy up. Very good album. As for the writing credits, it was less a case of Adrian Smith writing more songs, but rather Steve Harris letting other people's compositions have a chance. Good songwriter, excellent bassist, bit of a control freak. Wasted Years is just sweet as all hell. Excellent album. Nice review as well. Got my vote. Finally! I said in the other review that I was gonna review this, and I wrote the intro, but that's pretty much it. Good work, the album's pretty good. Alexander the Great owns. Brilliant album, superior to 7th Son and hugely ignored despite being a truly fantastic effort. I can't believ no songs off of this album make their current performance list. I enjoyed how you gave a lot of credit to Adrian, hes definitely an underrated player. This is one of Maiden's least popular and least advertised releases, which i cant see why, because its so great. I didn't like this album even if I've only heard it through once. Good review though. one of my favorite maiden albums. the cover art is sweet. I really liked Heaven Can Wait at first, but seven and a half minutes is just too long for a track like that. On the flip side, Deja Vu really grew on me. great review. this is a great album. i especially like alexander the great even if it does have some odd lyrics. i cant get enough of those iron maiden epics! Just started listening to this and so far I'm impressed. The first two tracks are incredibly strong. Whoa a Maiden album Thor's not heard? Kickass album though. I've been on a total Maiden spree as of late. It may seem like blasphemy as a metalhead, but this is the first time I'ver seriously given them a chance. So far, I'm hooked on Seventh Son and Powerslave. Nummer of the Beast and Piece of Mind are next. Although I've never heard the album, I absolutely love this review.